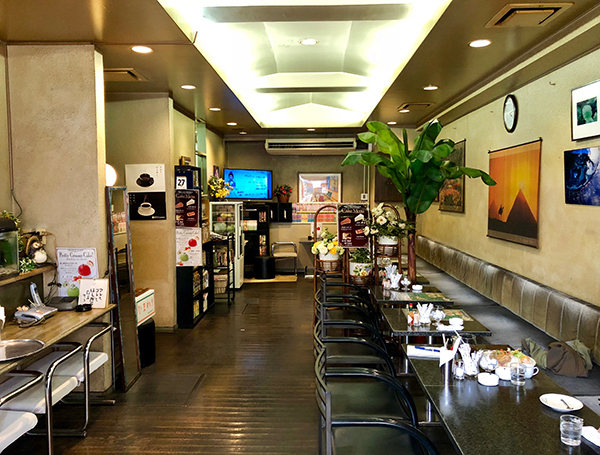 Coffee Oshokuji Hiroyuki is a restaurant and coffee shop located in the Fuyuki area of Koto-ku, midway between Monzen-nakacho and Kiyosumi-shirakawa stations. 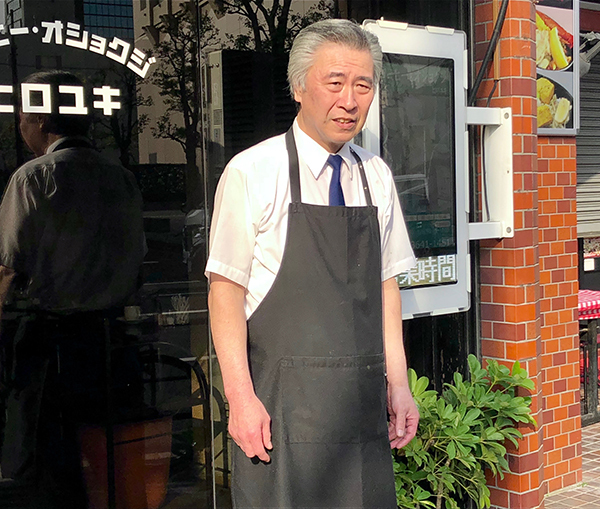 On a recent afternoon, we dropped in for a chat with the owner and proprietor, Mr. Hiroyuki himself. “In those days, there were many small businesses, especially printing companies, in this area. They’ve all gone now, replaced by much larger office buildings or high rise apartment blocks. Our weekday customers are mainly office workers coming in for lunch or an early dinner on the way home. At weekends, it tends to be local people dropping in for brunch, dinner, or a coffee and cake,” explained the trim and dapper Mr. Hiroyuki. 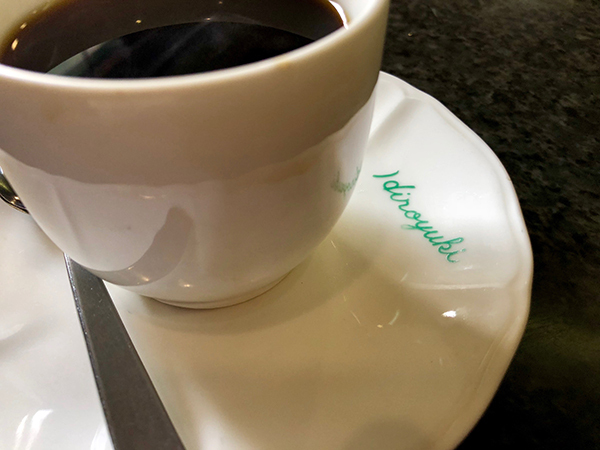 Coffee Oshokuji Hiroyuki offers “morning service” breakfast sets until 11:00 am. 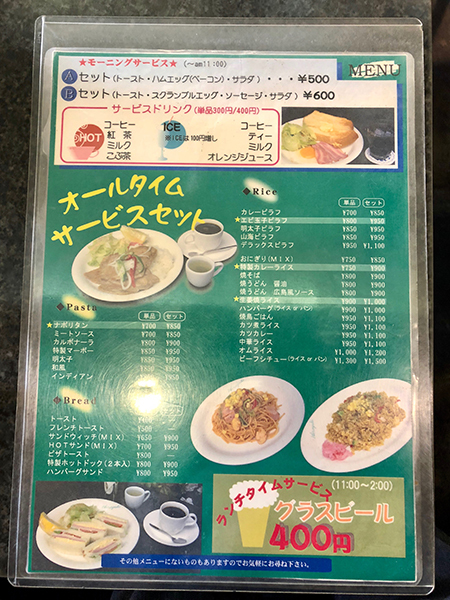 For 500 yen, set A features toast, ham/bacon and egg, salad, and a drink of either hot or cold coffee, tea, milk, orange juice, and so on. Set B contains toast, scrambled egg, sausage, salad, and a drink for 600 yen. These represent great value as the drinks cost 300 or 400 yen when ordered individually. 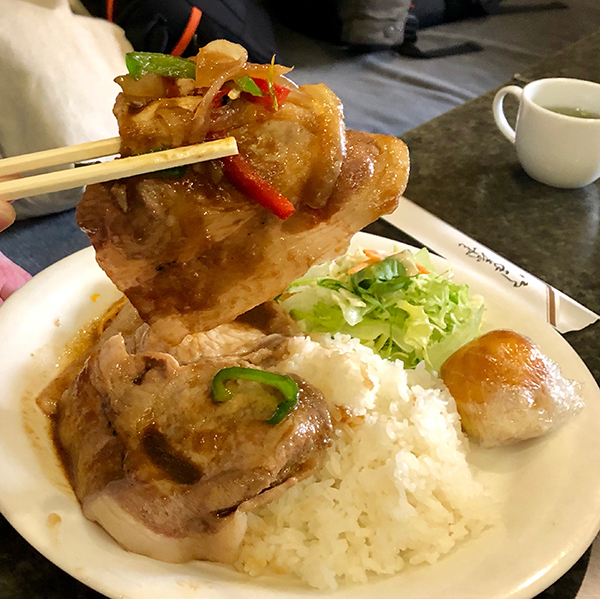 The daily menu features such Japanese coffee shop classics as stir fried pork with vegetables (stamina yaki), Napolitan spaghetti, pollack roe spaghetti, shrimp pilaf, curry and rice, pork cutlets, hamburg with demi-glace sauce, and the top selling pork and ginger. 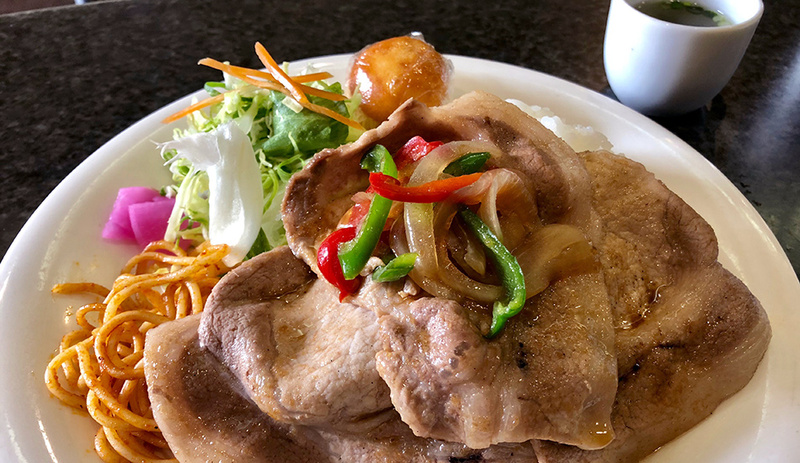 Mr. Hiroyuki kindly whipped up a plate of the latter and very good it was too; juicy, gingery pork slices served on rice with salad, spaghetti, onion and peppers. It comes with a choice of drinks and is terrific value at just 900 yen. There’s even a small bun for dessert! 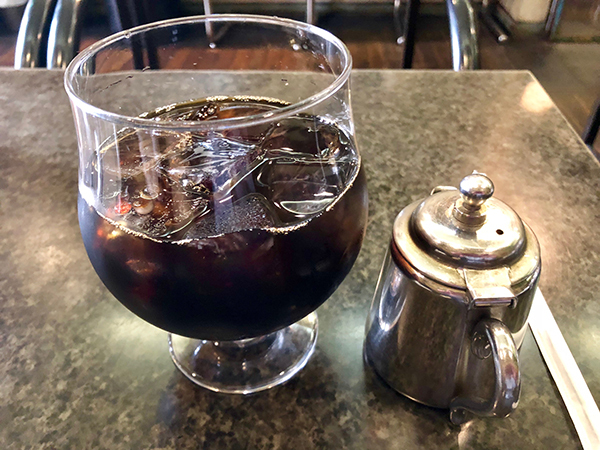 Order an iced coffee and you receive 500 ml of very tasty chilled coffee in what looks like a large brandy glass. Fantastic! Afternoons from 2pm are coffee and toast set time for just 510 yen, or cake set time for 700 yen. Chocolate, rare cheesecake, or apple tart are on the menu. 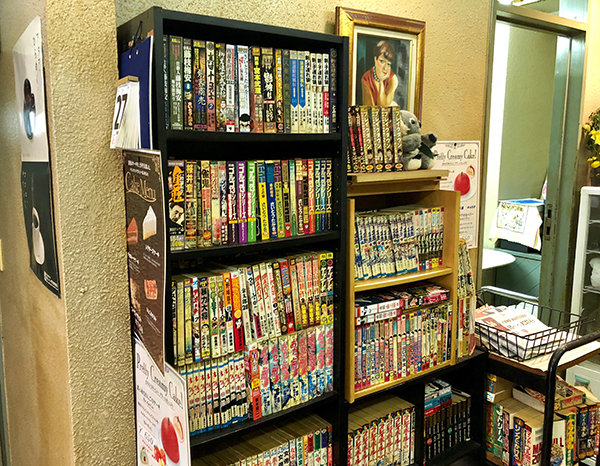 Coffee Oshokuji Hiroyuki also has a sizable collection of popular comic books for those who wish to read with their coffee. The drip coffee is excellent; strong and rich, it comes in a rather stylish cup and saucer. 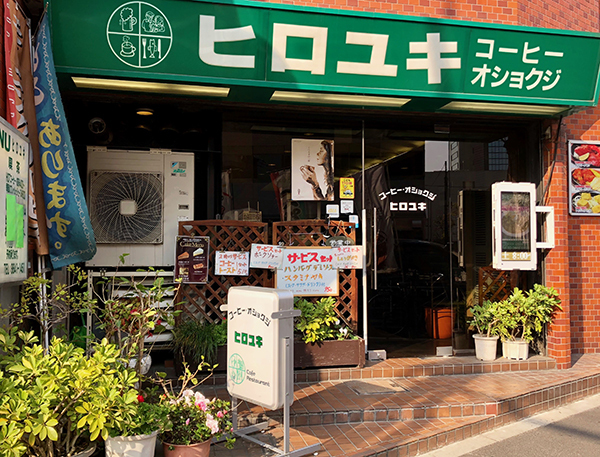 Coffee Oshokuji Hiroyuki opens from 8am to 10pm every weekday. 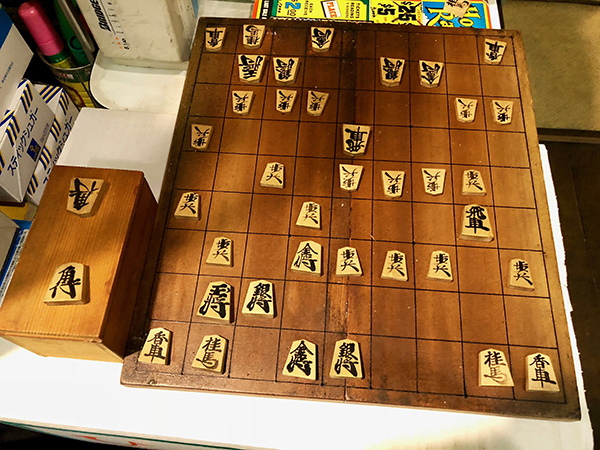 The proprietor is a keen player of shogi (Japanese chess) and achieved a ranking of 2-kyu in his younger days. He’s always available for a game if work isn’t too busy. 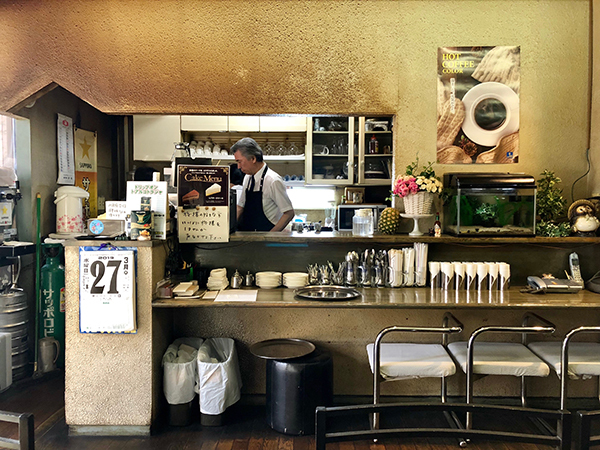 Coffee Oshokuji Hiroyuki is a classic example of the traditional Japanese style coffee shop and restaurant. The atmosphere is comfortable and friendly, the meals tasty and hearty, and the coffee strong and hot. The prices are very reasonable, too. If you’re in the area and feeling a trifle esurient, why not pop in; your appetite and wallet will be glad you did!